Many of our members have experience in removing bees from your home, business or garden. 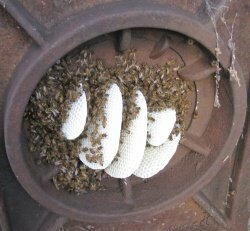 Call us preferably in the spring or summer to give the bees a chance to survive the winter after we have removed the colony. Most beekeepers charge for this service because of the time, resources and education needed to remove bees. Hi, Thank you for visiting this page, Please note Antiguasdelnorte Honeybee Rescue Farm is licensed and insured to perform Live Honeybee removals. We do not engage in asking for a donation we will tell you the exact maximum charge or if you are receiving a free early season removal we will not ask for a donation. I perform 10 to 20 FREE cut out removals a year. We also remove Swarms for free in our service area. We have a very high success rate and we keep the bees for our pollination and bee propagation efforts. “Help us to Help Honeybees with People Problems”.